Travelling to Ios Greece is well worth it for a little bit of effort! There is no airport on Ios, so the island is only accessible by ferry. Most people choose to fly directly to Athens, Santorini, Mykonos or Crete and then take the ferry to Ios Island. This page will provide you with the best ways on how to get to Ios Greece. Boats and ferries to Ios depart from 2 ports in Athens – Piraeus and Rafina – from and to Ios Island Greece. During the summer months, ferries to Ios run pretty frequently – there are normally about 2 to 3 ferries each day. It takes about 3 to 7 hours depending on which ferry to Ios you are on. Please be aware that the ferry timetables are not published until later in the year, so the full schedule may not be available until closer to your departure time. Use our affiliate partner ferry booking tool on the right of this page to book your ferry ticket to Ios. Depending on which ferry you take, the ferry will stop at Paros, Naxos or Mykonos before arriving in Ios. You may also need to spend a night in Athens depending on what time your ferry leaves at. Check out “hotels in Piraeus here or hotels in Rafina here. Piraeus port is located about 45km from Athens International Airport (Eleftherios Venizelos) and 12km from Athens city centre. It is the largest port in Greece. Use our affiliate partner ferry booking tool to book your ferry ticket to Ios by selecting “PIRAEUS/Athens” to Ios. – By Bus – take the x96 bus. It’s only €5.00 per person, clean, air conditioned and just as fast as taking a taxi. The bus from Athens to the port of Piraeus takes about 1 hour to 1.5 hours depending on traffic. The bus leaves every 20 minutes during the day and every 40 minutes at night (22:30 – 05:00). You need to buy a ticket before boarding the bus from the kiosk outside arrivals, and remember to validate your ticket in the yellow box when you get on the bus. 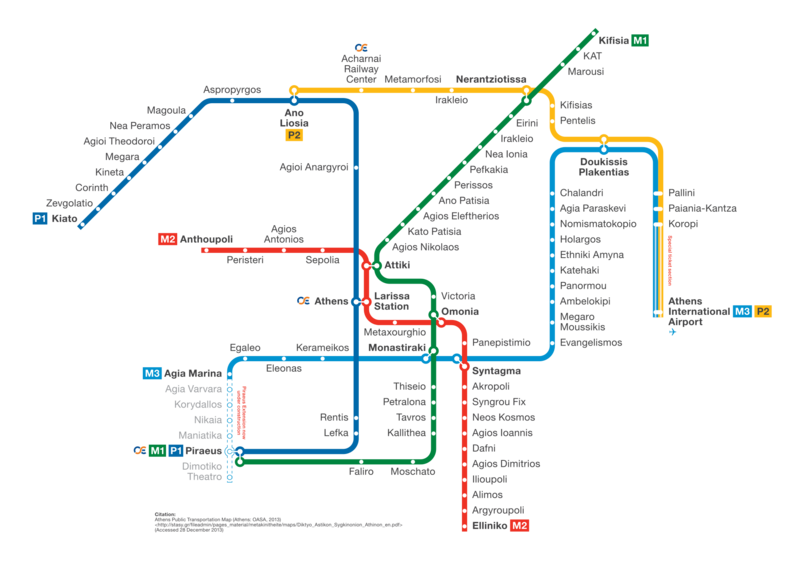 – By Metro – the train station is connected to the airport. Take the Blue line (M3) from Athens Airport to Monastiraki, then change onto the Green line (M1) to Piraeus which is the last stop and right in front of the port. There are discounts available for additional people e.g. for 1 person to travel the cost is €8.00, for 2 people it is only €14 and for 3 it is €20. Trains run every 30 minutes (on the hour and half hour) from 05:30 – 00:15 (02:00 on Fridays and Saturdays). The journey takes about 1 hour. 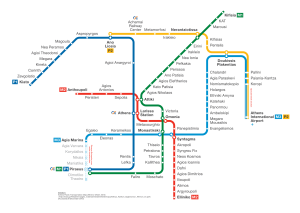 Enlarge the Athens Metro Map by clicking on the image to the right for more information. – By Taxi – there is no flat rate for travel by taxi from the airport to Piraeus Port. The journey is about 40-60 minutes and it should cost about €50 during the day and about €65 at night. Rafina Port is 10km away from Athens International Airport and 30km from Athens city centre. It is the second largest port in Athens. Use our affiliate partner ferry booking tool on the right of this page to book your ferry ticket to Ios by selecting “RAFINA/Athens” to Ios. – By Bus – take the direct orange KTEL bus from Athens Airport to Rafina port. It departs from the Arrivals level between exits 2 and 3. The bus departs every hour and takes approximately 30 minutes. The bus costs €3 per person and operates from 04:50 until 22:15. – By Taxi – a taxi takes about 20 minutes from Athens Airport to Rafina port, and costs about €35 during the day and €50 at night. If you fly into Santorini Airport (Thira) you can get to Ios Greece much the same as from Athens. Ferries to Ios from Santorini depart daily, and only take about 45 minutes. Use our affiliate partner ferry booking tool at the top right of this page to book your ferry ticket to Ios by selecting “SANTORINI” to Ios. You can take a taxi or bus from the airport in Santorini (JTR) to the port to get your ferry from Santorini to Ios Greece. Depending on flight times you may not need to stay in Santorini overnight, but it does break up the journey to Ios Greece. There are lots of hotels in Santorini to choose from, but try to find one that will pick you up at the airport and drop you to the port when you are ready to depart for Ios. Be aware that there is sometimes a fee for this service. You will then arrive fully refreshed and ready for whatever Ios has in store for you on your first night back or your first taste of Ios nightlife. Click here to book your Santorini. Mykonos Airport is located about 3km away from the port of Mykonos. There are 2 ports in Mykonos – the Old Port which is 400m north of Mykonos Town and the New Port 2km north of the town in Tourlos. Most ferry companies dock and leave from the New Port but you should always double-check which port your ferry leaves from. Ferries to Ios from Mykonos depart daily in peak season and take just over 2 hours. You can take a short taxi ride from the airport to the Port. You may need to stay in Mykonos overnight depending on what time your flight arrives. Click here to book your Mykonos hotel. A lot of hotels offer a pick up and drop off service from the airport and ports so try to find a hotel which offers this service.Click here to book your hotel in Mykonos. Use our affiliate partner ferry booking tool at the top right of this page to book your ferry ticket to Ios by selecting “MYKONOS” to Ios. If you have any other questions about how to get to Ios Greece, please email us at info@loveiosgreece.com.